The Tamarindo Diria Beach Resort can be a great place to escape to when a break from the everyday routine is in order. Set among swaying palms, this beachfront retreat in Costa Rica’s Guanacaste province offers a wonderful atmosphere. It also offers an excellent array of facilities and amenities. Among the facility highlights are several swimming pools, one of which is the biggest pool in Tamarindo. In the 239 tasteful guest units, standard amenity highlights include flat screen TVs, air conditioning, and free high-speed internet access. There are five different room categories, and some rooms offer extra amenities for those who wish to take advantage. 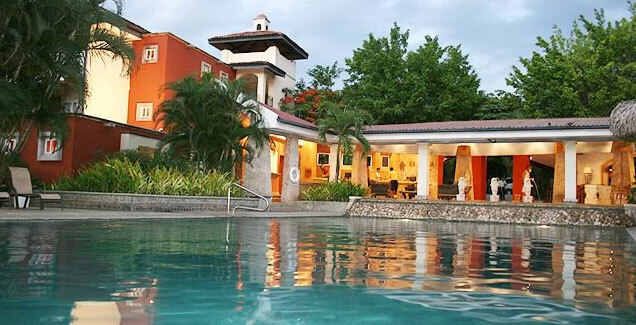 At the Tamarindo Diria Beach Resort, guests should find it easy to achieve relaxation. There are plenty of grassy areas where lounge chairs mix with palm trees and other tropical foliage. Should some time on the sand be in order, beautiful Tamarindo Beach is just steps away. Guests can also relax at one of the resort’s swimming pools or kick back in their comfortable rooms. When it comes time for some excitement, guests of the Tamarindo Diria Beach Resort can tempt Lady Luck at the onsite casino. The resort also has its own driving range, and guests enjoy special rates at two nearby golf courses. Arranging tours is just one more option for things to do at the Tamarindo Diria Beach Resort. Among the activities that can be enjoyed on the various tours are ATV riding, snorkeling, scuba diving, sport fishing, horseback riding, sailing, and river rafting. There are even tours that include trips to Costa Rica’s famous Arenal Volcano National Park. The Tamarindo Diria Beach Resort offers proximity to an array of restaurants. Guests can also dine at the resort itself. Among the onsite eateries are a wonderful waterfront restaurant, an excellent fine dining establishment, and a casual restaurant that serves up such delights as pizza, hamburgers, quesadillas, and international wines. Complementing the restaurants at the Tamarindo Diria Beach Resort are two bars. It should also be noted that the resort offers meeting space and can help guests arrange all kinds of private functions, including beach weddings.